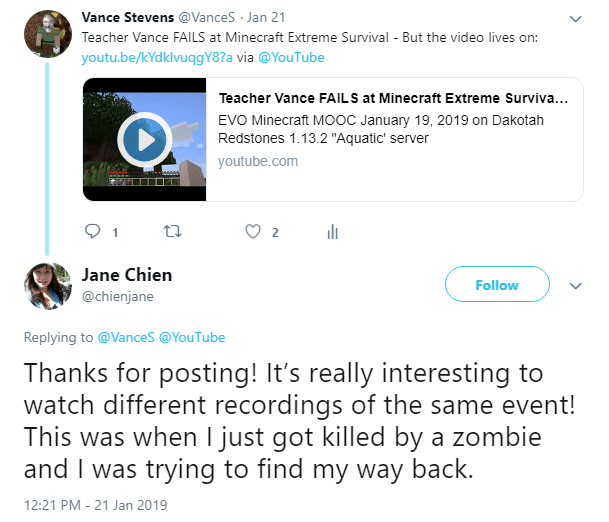 The 2019 rendition of EVO Minecraft MOOC, http://missions4evomc.pbworks.com/, entered its second week on Sunday, January 20. 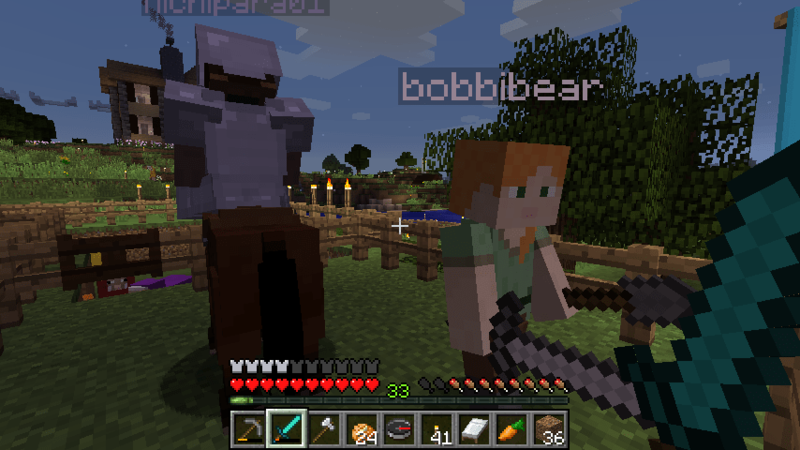 On that day I had announced my availability for around 1400 UTC in one of our Guided sandbox practice sessions where I promise that Teacher Vance and Bobbi Bear will be online to meet participants in-world and help in whatever way we can to get them up and functioning on our EVO Minecraft MOOC 1.12.2 server. 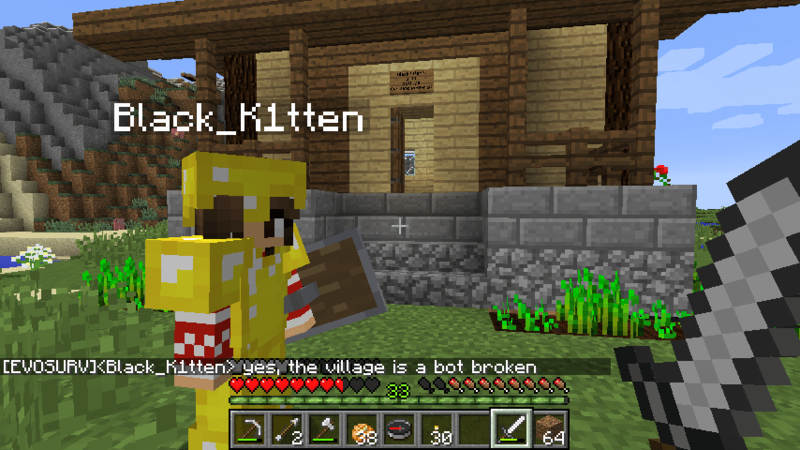 In my guise as Teacher Vance, I went online at the appointed time and found “Black_Kitten” there. The odd thing was, she was in the game in text chat, but I couldn’t find her on the map, here. She was confused herself about where she was. 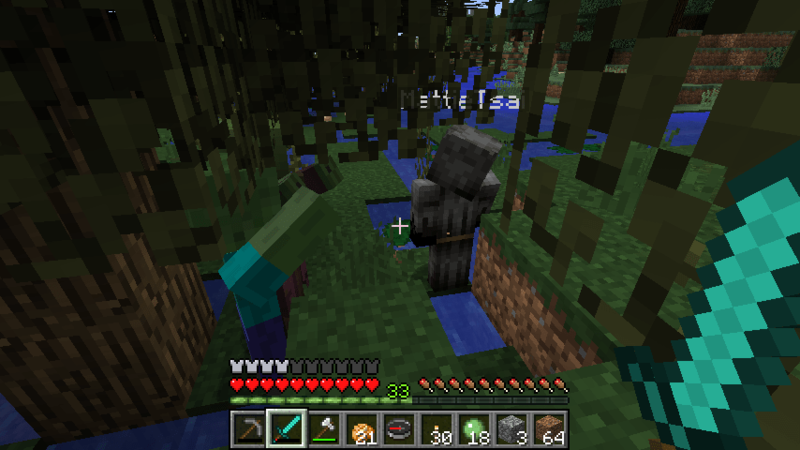 She had built a house somewhere on our server but had wandered away from it and now couldn’t get back to it. So I offered to teleport to where she was, and I found her in a village with an extensive library and librarians who will trade emeralds for paper. But having joined her, I couldn’t even find myself on the map now, so we were both lost. Where? 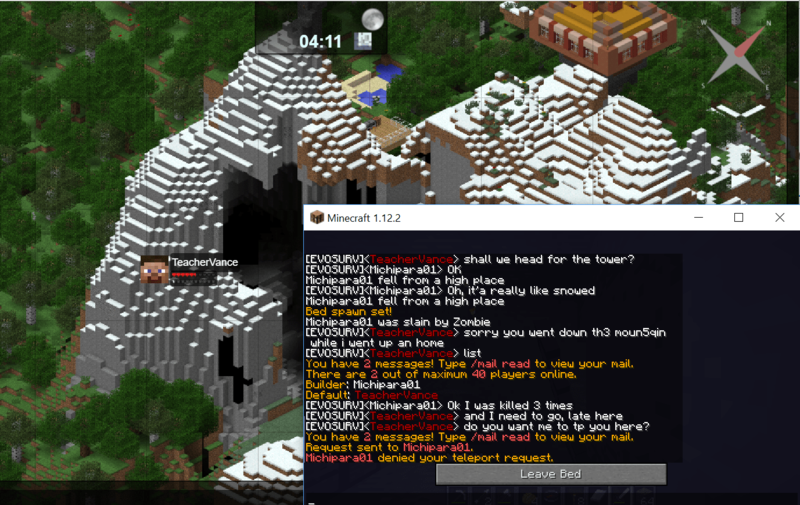 My instructions were to meet at Birch House on the EVO Minecraft MOOC 1.12.2 server. Birch House is the 2019 spawn point, or from anywhere on the server, you can use /warp 14k to get there. 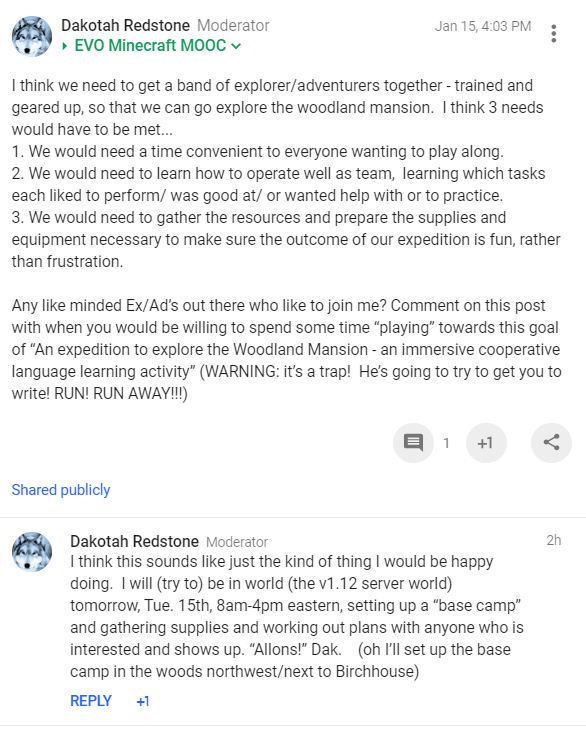 i said we would use Dak’s Wilderness Warp in the BirchHouse to arrive in The Wilderness, an untamed and as yet unmapped place where the air is clear and the land pristine. When we arrive we’ll head west, the direction shown in this image. But you can see in the video that when I got there, I told the group to go east, my bad – fortunately others knew the way so we eventually arrived at “Black Kitten’s Village,” which I also found out had another name, Riverbend. Black Kitten had told me the day before that she wanted help finding clay to make flower pots and in setting up a kind of dock to act as an exchange point for travelers who might find her home. I followed up on that by adding a few planks of wood to the extended pier, but soon went off to try and find what others were doing. Apart from that, the village, and the area, was interesting to explore. Don Carroll (Abu Fletcher), Dakotah Redstone, Jane Chien, OliveTree Lighthouse, Mircea Patrascu, and Mattie had all turned out for it. The group soon focused on helping Abu Fletcher build a swank California style house near the village. 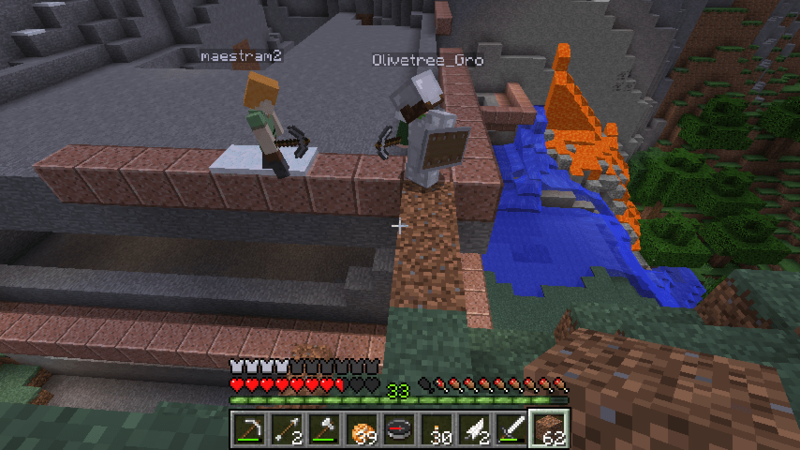 I built a tunnel from there up to a bridge that I discovered Dak had built (in case you were wondering what I was doing for much of my time in the video), and in the end we visited where OliveTree and Dak are curing a zombie on a mountain top near the 24k warp point, and learned some details about that process. About “Share the Love” – a.k.a. 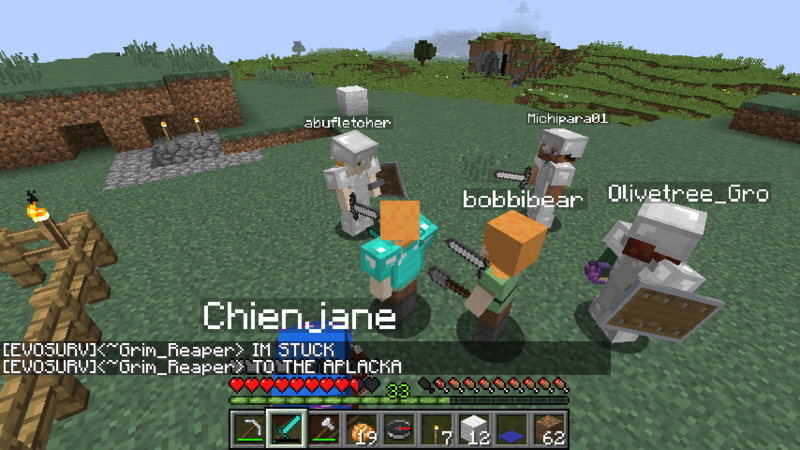 Hug a Creeper – lessons in seeing things differently, or “Why dying’s not so bad after all”. We’ll talk about the meaning behind the event during or after we finish it, according to the preferences of the participants. 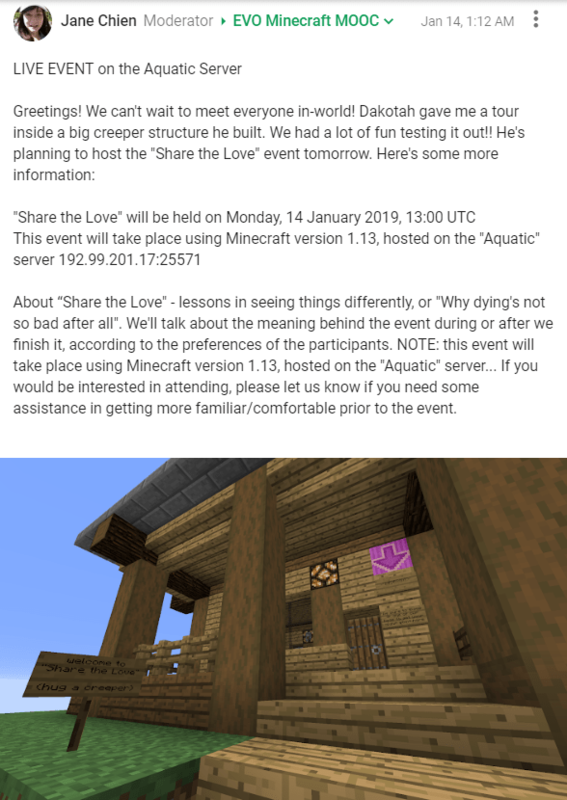 NOTE: this event will take place using Minecraft version 1.13, hosted on the “Aquatic” server… If you would be interested in attending, please let us know if you need some assistance in getting more familiar/comfortable prior to the event. Follow the white path, read the signs, be guided by tiles of gold, listen to the messages, talk to helpful villagers and travelers, find your way to the halls of knowledge and claim your treasure of gold. Remember to take pictures and at the end take a selfie to show everyone your achievement. 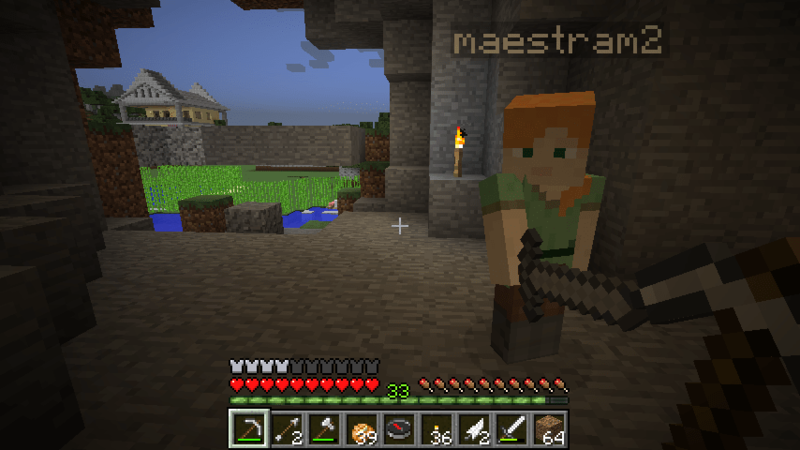 Guide participants who are new to gaming in general and Minecraft in particular through learning the basic skills of how to move and interact with different in-game tools and items. Give participants an opportunity to experience an example of some of the Minecraft items and functions/mechanics that can be used in learning activities. It was getting dark (and Bobbi had to call her mom :-), so Vance and Michiyo warped to the Woodland Mansion, but it turned out to have been already tamed. I (Teacher Vance) saw from the map that we were not far from southeast of the spawn point for this year so we headed on a northwest trek, digging an L shaped cave to stay safe one night, then putting our beds on a well-lit beach the next (I always carry torches). I reached the Birch Mansion at the spawn point the following day but Michiyo, who had been trekking wonderfully for the past half hour, even following in swims downstream, somehow drowned just short of the goal. It was time to return to real life anyway 🙂 so I quickly completed the trip alone. Michiyo was on the server but she had to go and tend to her studies. 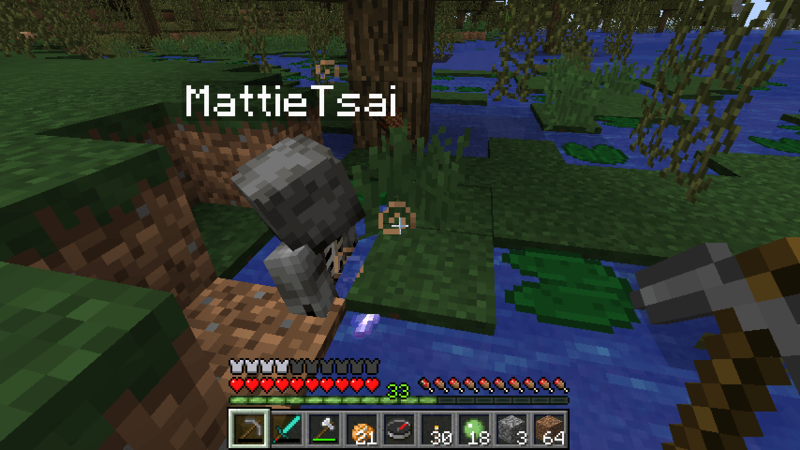 Mattie Tsai, Jane Chien’s son, was there and I noticed he was in the vicinity of a house he must have built in a swamp not far from the spawn point, so I headed out overland to reach the spot. It’s about a day’s trek from the spawn point if you know where you are going, but I didn’t so it took me longer, two nights. The second night I camped out on a beach on my bed and survived the night. 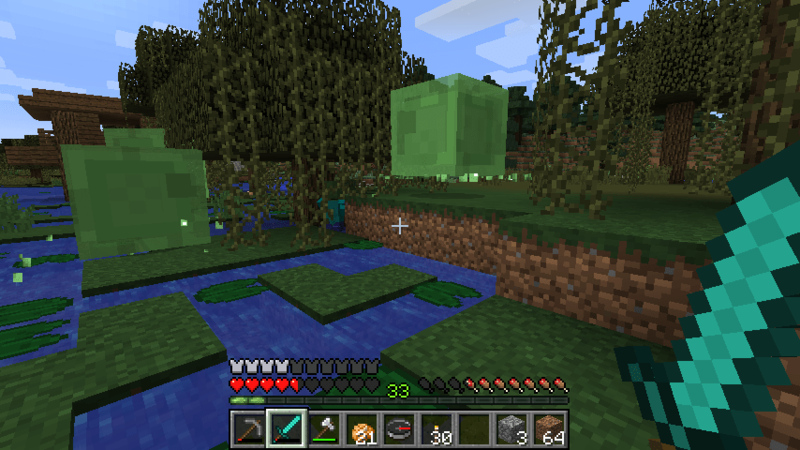 Next morning I found myself surrounded by slime. Olivetree in Discord told me they were hostile, but I could slay them for slime balls, so I did that. Moments later I found Mattie, mired in the swamp, and under attack by zombies which I slew snicker snack with my vorpal blade. To red, to grey / red, and back and forth again. I sent a screen shot to Olivetree and Dak in Discord, for their diagnosis. 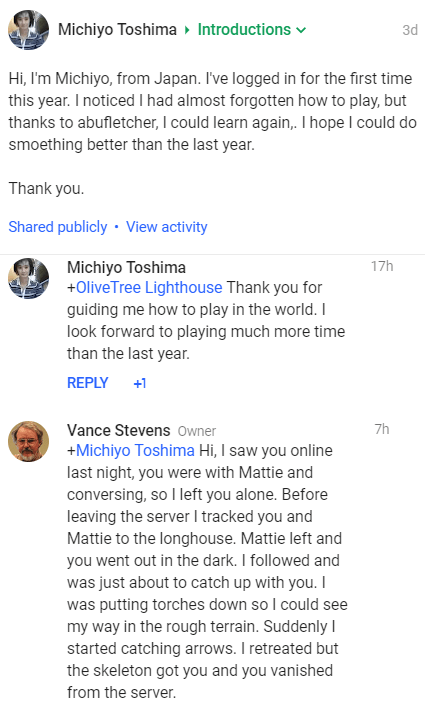 Dakota in Discord explained that Mattie had unfortunately, erm, uh, passed away. His mom will be sorry to know that. From there I retraced my steps back to my house near the spawn point and laid down a track as I went, in shoveled earth and in torches. Next day I will try to improve the path. I may lay a similar one from the spawn point to the Woodland Mansion, though bereft of it’s original mobs, it seems to be of little interest to hard-core community members. We decided to follow the river over to Jo Kay’s old place. We survived the night there. In the morning we went up the mountain looking for Rose Bard’s old place but couldn’t recall how to get there. But I spotted a settlement of some kind to the northwest. I was using the map and trying to keep the group together for most of the day. But people dropped back one by one. As you can see in the map view below, it’s after midnight already and I can see the lights of the village. I’m heading for it. It was getting late in real life too. I just wanted to reach it before I had to leave the server, or die in the attempt. I survived by spending the night in a tower. 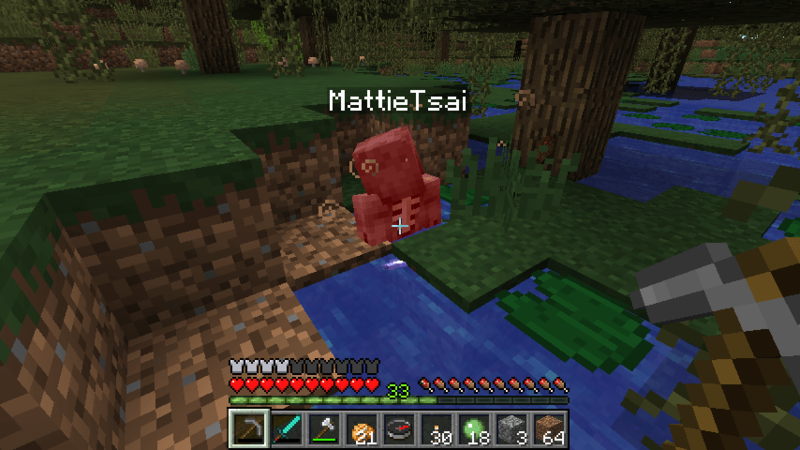 Michiyo appeared at the appointed time, and I joined her at the spawn point. We decided to go in search of the House of Knowledge which entails talking to avatars outside the birch house and then following the speckled white path to the riverside where boats are waiting. I got in a boat and invited her to do the same. I saw her in the river and she kept going down it in a fast-paced swim, so I followed. I finally caught up with her near the mouth of the river at the edges of terra incognito. Dusk was near, so we planted torches, laid out some beds, and made it light again, since it was only us on the server. I asked if she wanted to go back or onward, she said onward, so we explored the coastline to a point where we could see Dak’s mushroom structure on the mountain top in the distance to the west. It was getting dark so we set up beds in torchlight where we were and survived safely until it got light suddenly. I said I would remain one more Minecraft day and suggested we head back toward the mushroom structure. We traveled through a forest and came to the back of the mountain where we climbed up toward the mushroom on the other side and walked on the top of it, where passing clouds sometimes obscured our view on the green valley below. It was getting dark so I started heading toward my home base via my mountain tunnel to the north. I lost Michiyo suddenly and Dak told me in DIscord that she had found his secret tunnel and would emerge the other side, so I went down the mountain to try and intercept her. I could see on our map that we were right on top of one another, though she was inside the mountain. 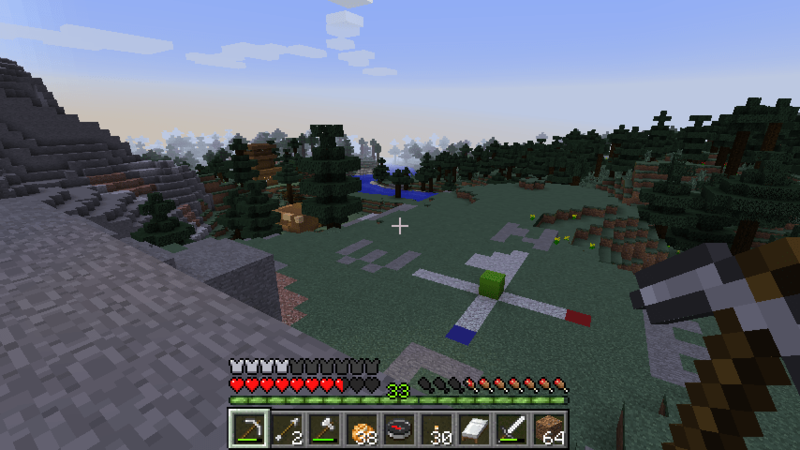 I started up the mountain to my tower on the top and since it was dark I laid torches for her to follow. Maestra Mirelle was moving about quite well, following instructions in Discord and successfully swimming the river to enter the cave full of minerals at the Temple of Lost Knowledge. To facilitate travel, I built a land bridge from the Temple of Lost Knowledge to the landform leading to my castle. I must remember to go back and remove it lest mobs use it for nefarious purposes. It was too hectic for me to take any photos and while we communicated a LOT we were also talking over each other and often engaged in overlapping conversations much of the time (which is a possible feature of group interaction anytime there are more than three participants). One failing (if we can consider it a failing) is that we never had any clear objective other than just surviving. I suppose that’s OK.
On the plus side, as a group, we divided tasks, shared resources, worked together, all of which required substantial language use. This would have been too overwhelming for my Japanese EFL learners, but would have worked for more intermediate learning, I think.